KONG Puppy is specially designed to help puppies during the chewing period of losing their milk teeth and growing adult teeth. Available in three different sizes. 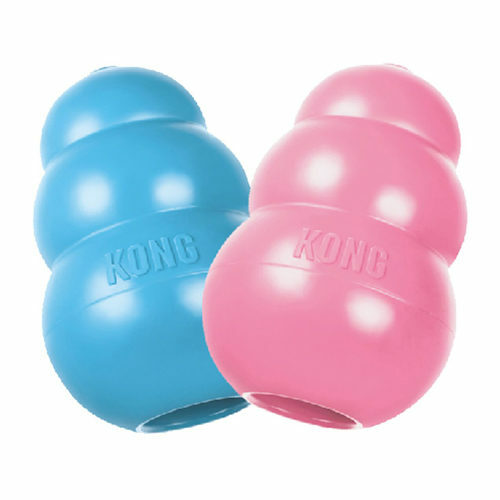 The Puppy KONG is made from a soft, flexible rubber that massages the gums. If additional relief is needed for sore gums, the KONG can be cooled in the refrigerator. The KONG Puppy is available in three sizes and can be used until the age of 9 months. Please note: This product is selected at random, therefore no colour choice is available. Have you used KONG Puppy before? Let us know what you think about this product.